A highly efficient Outdoor Camping Kit which is suitable for Car Camping, Fishermen, Family Picnics, Camping, Scouts, Kayakers, Caravan Camping or anyone working in the outdoors. A vital item also for Wilderness Survival Kits / Disaster Kits. This 37.2 oz capacity kettle, cook set and pot support all fit neatly together into their own drawstring carrying bag which can be put into or carried hanging from a rucksack or backpack. As there is no need to carry fuel, this kit will keep your pack light and save you money at the same time – never worry about running out of fuel again! Using any naturally occurring solid fuel (sticks, pine cones, dry camel dung! etc.) this unit will operate perfectly well, even in the most extreme weather conditions or terrain. The kettle brings 37.2oz., 1.1 Liters, or 4.65 cups of water to a rolling boil (purifying the water) within a matter of minutes while you reheat or cook food at the same time using the cook set on the pot support over the chimney of the kettle. Hence, a very small amount of fuel will both boil your water and cook your meal at the same time! 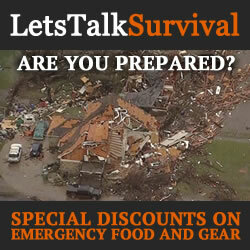 As a prepper and a survivalist, I am always interested in the most efficient and effective products and solutions available, and I am continually adapting my survival plans accordingly whether it be a bug-in or bug-out scenario. In some cases, these two plans have areas where they overlap, and other areas where they don’t. As a result, I am always searching for equipment that performs well in the widest-range of scenarios. When the grid goes down and you lose the stove, oven and even chef mic, having good outdoor cookware will be critical for boiling water and cooking food. In some cases, you may even need to adapt your cookware to distil water if fresh water is not readily available. 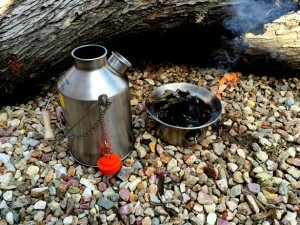 Recently, I found an interesting kettle kit and cooking system known as the Kelly Kettle. Pioneered by the Kelly family back in Ireland for more than 100 years, the Kelly Kettle offers a very unique spin on a natural fuel cooking system. No tablets, liquid fuels or fuel cells required with this one. The model that I’m reviewing in this article is the medium-sized Stainless Steel Scout capable of heating 37.2 fluid ounces in a little less than 5 minutes. Perfect for small groups and camping out of a vehicle. Packed neatly inside the durable dark-green nylon pouch, the Scout stands a little over 10″ tall, almost 7.5″ in diameter and weighs a whopping 38 ounces plus another 17 ounces with all of the accessories included. As a result, it is quite a bit larger, much heavier and less portable than most of the packable cooking systems out there. However, there is an aluminum variation of the Scout that weighs about 25% less for those that don’t mind boiling water in aluminum containers. 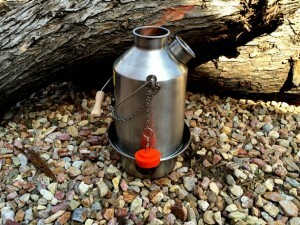 Kelly Kettle has a smaller model capable of heating 17 fluid ounces called the Trekker. 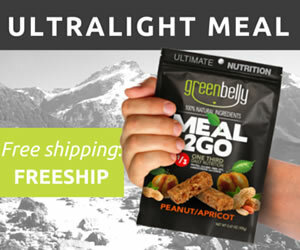 At only 27 ounces, it is much lighter and better-suited for solo backpacking. The Trekker is also available in aluminum, and it too is about 25% lighter than the stainless steel model. 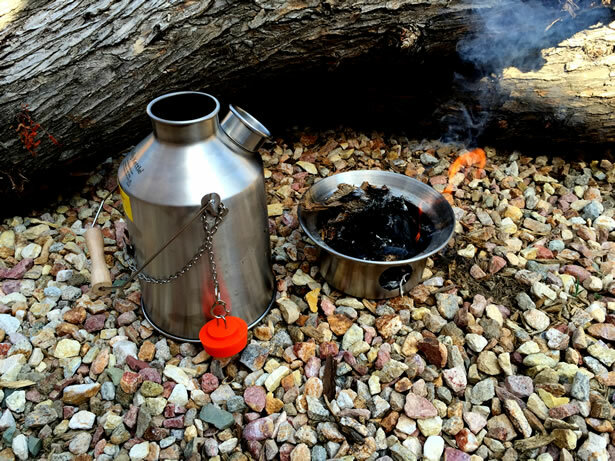 A Kelly Kettle is also available in a larger Base Camp size which is capable of heating up to 50.7 fluid ounces and weighs in at nearly 2.5 pounds. The lighter aluminum model weighs only 2.1 pounds, but it can hold a little more liquid at 54 fluid ounces. 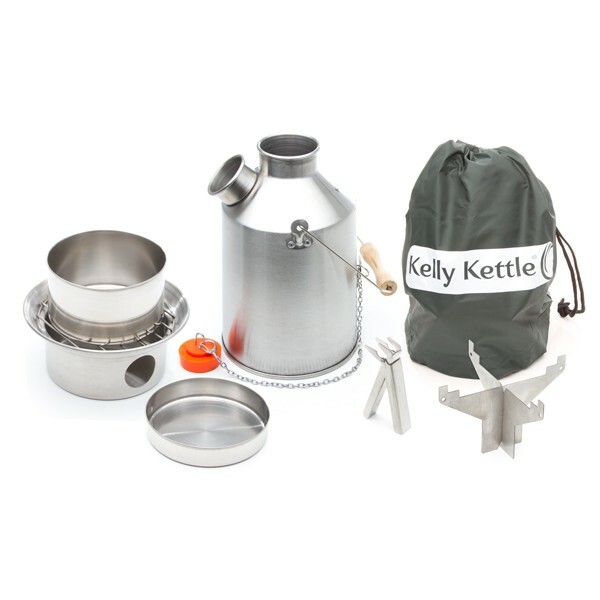 Each Kelly Kettle consists of two primary components, the kettle and its firebase, and if you happen to purchase one of the many Kelly Kettle kits, a set of various accessories are also provided. The firebase was machine pressed from a single piece of heavy-gauge stainless steel making it exceptionally rugged. It looks much like a bowl with a tapered upper ring and a 1.5″ hole in its side. The Scout’s firebase is approximately 3″ tall and 7.5″ in diameter at its widest point. This is where you place the fuel, and is the foundation of the kettle system. You can use most any natural fuels from pine cones to small tinder, coal, or any other flammable material you have available. You can even use an alcohol burner if you’ve got one handy. However, to use an alcohol burner efficiently, you will need to restrict the flow of the exhaust out through the chimney. Preventing the heat from escaping too quickly will dramatically reduce the amount of time it takes to bring the water to a boil, thereby saving fuel. The kettle itself stands a little less than 10″ tall and about 6.25″ in diameter at its widest point. The kettle consists of two panels and a spout, each machine pressed from heavy-gauge stainless steel and seamed together at each end for extreme durability. Between the inner and outer walls of the kettle is the pocket that holds the water. 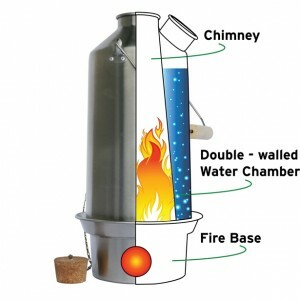 In addition to the holding the water, the inner wall also acts as the kettle’s chimney where the heat warms the water. There is a wire bail handle frame attached to two spot-welded brackets and a wooden handle across the center for easy handling and protection from the heat. In the original design, they used pop rivets to attach the brackets but after a recent design change they began using spot welds to prevent occasional leakage. Additionally, the kettle includes a red silicone stopper tethered to the kettle by a strong stainless steel chain. Ideal for sealing the spout when the kettle is not in use. The pot support is basically two pieces of sheet metal that fit together to hold most any pot when it is inserted into the kettle chimney. All of the heat rises through the kettle’s chimney allowing you to cook while you boil water. The drawback to this is twofold. One, this adds to the height of the kettle system and therefore becomes less sturdy. Two, The distance above the flame is not adjustable so your results may vary. The pot is made from a heavy-gauge stainless steel so it is both durable and easy to clean. It is almost 3″ tall and just over 5″ in diameter so it is capable of holding about 4 cups. The lid doubles as a small frying pan. It is a little more than 1″ tall and 5.5″ in diameter. The cooking set also includes a simple handle for the pot and pan as well as a two-piece wire grill which fits in the firebase. One accessory that I wish came with my Scout kit is the Hobo Stove. This simply a steel adapter ring with raised pot supports that easily converts the firebase into a hobo-style stove, perfect for cooking with most any pot or pan. The Hobo Stove ring raises the platform where the pots sit allowing better air circulation. It can be used with or without the firebase and stows easily inside the firebase when not in use. The Kelly Kettle is very top-heavy so to safely get it going, you would start by placing the firebase on a flat-level platform to prevent it from becoming unstable. It is also important to consider that the firebase will become extremely hot so setting it up on snow or on flammable material would be far from ideal. Additionally, it is also important to consider the height of the chimney and where the superheated exhaust will exit. Be aware of any low-hanging foliage directly above the chimney. First, ALWAYS remove the stopper before placing the kettle onto the firebase. Not doing so could cause the kettle to leak from the seams or cause serious injury from the built-up pressure. The stopper is only to be used for transporting cold water. Second, the kettle MUST contain water when it is placed onto the firebase. The inner wall and seams could easily crack from the excessive heat. It is the water keeps it from overheating and damaging the unit. Third, never hold the handle above the chimney when the kettle is lit as it can result in a serious burn. Fourth, do not overfill… Once the water reaches a rolling boil it could spill out and put the fire out in the firebase. It is best to leave about an inch of space below the brim. And most of all, ALWAYS keep children away from the kettle when in use. Once the firebase positioned, simply add the smaller fuel followed by any fire-starting aids like fatwood, straw, cotton, magnesium shavings, or any other flammable material that you might use to help get the fire going quickly. Once the fire starts to take off, it is time to add the kettle. When adding water to the kettle, it is a good practice to only add clean or prefiltered water. Simply prefiltering the water with a cloth, bandana or coffee filter will help keep the inside of the kettle clean much longer. The kettle water chamber is a very difficult place to clean. You can easily add fuel as needed through the chimney as needed. But keep in mind that you don’t need very much fuel… If you happen to add too much fuel, then you will likely need to let it burn down some before lifting the kettle off of the firebase or you could end up with a bit of an unsafe mess. Once the water is boiling, hold the wire handle at a 90° angle, perpendicular to the body of the kettle, then lift kettle. To pour, simply lift the kettle by the handle, then tilt it using the rubber stopper chain. 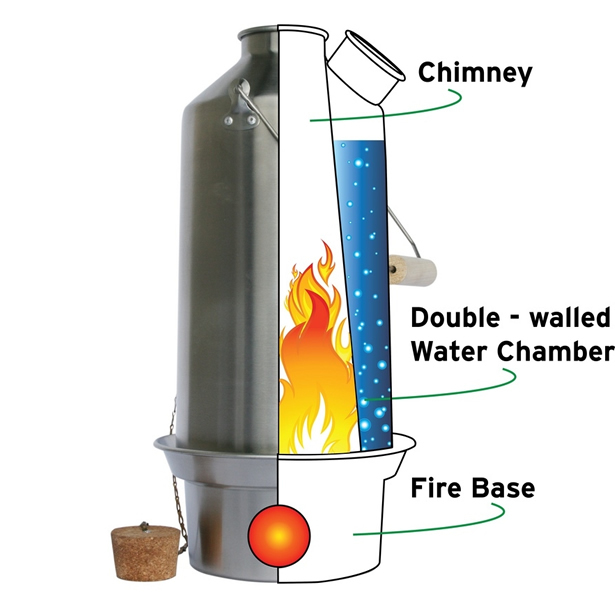 The combination of the firebase and the kettle with a chimney works much like a rocket stove by pulling oxygen into the burn chamber causing it to superheat thus dramatically improving the kettle’s burn efficiency. As a result, the kettle will typically reach a rolling boil water in little less than 5 minutes. If you need more that one kettle-full of hot water, simply refill the kettle, place it back on the firebase, and refuel as necessary. After the heating first kettle full of water, each subsequent one will reach a rolling boil much faster as the fire is already going and the kettle itself is already hot. In my experience it took about 1.5 minutes less for the second kettle full. Cleaning the exterior of the Kelly Kettle is as easy as giving it a little scrub with a green scrub pad and water. Just enough to get the bulk of the soot and burn residue off. Additionally, it is best to dry the kettle out before plugging the spout to prevent mildew as well as that unpleasant taste and smell. Packing up the Kelly Kettle is really pretty easy… To start, you fill the pot with any small gear that you would typically pack with your cookset like the pot handle, a firekit, seasonings, utensils, and even fire-starting material like tinder and fatwood. Next, you cover the pot with the lid and place it into the firebase. The grill and pot stand both fit neatly into the bottom of the kettle followed by the firebase. The firebase fits snuggly into the bottom of the kettle upside-down. Finally, the entire kettle system is placed into the nylon bag and the drawstring is then cinched to keep everything together. 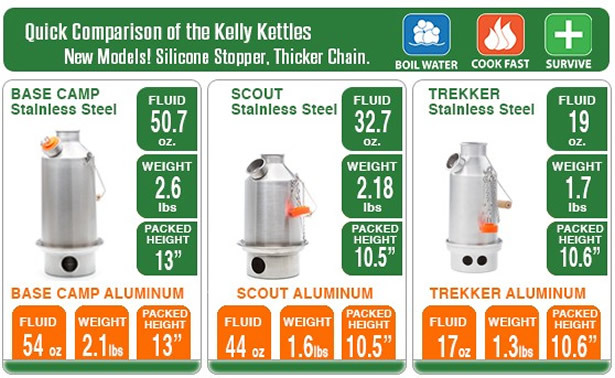 Each Kelly Kettle comes with a 2-year anti-leak warranty. Replacement parts can be ordered individually for any Kelly Kettle model directly from their website. The Kelly Kettle is an elegant, eco-friendly and highly effective outdoor cooking system specially designed for bringing water to a rolling boil as fast and efficiently as possible which is an essential consideration for every emergency preparedness plan and survival scenario. No need to carry or horde fuel and perfect when you want to leave no trace behind. Its exceptional quality and rugged durability coupled with its ability to operate regardless of the weather condition, terrain or fuel source is nothing short of impressive. As with any cooking system, there are typically some cons to consider as well… To me, the two biggest drawbacks to the Kelly Kettle system are its size and weight. However, I just don’t see a way it can be made smaller and still do what it does best. As for the weight, I really don’t think building it out of a lesser material is worth the weight savings. It would be nice have measurement markings stamped on the side of the pot, and it would also be nice if the pot and lid had folding handles as well. Additionally, if the ring at the end of the chain was a size or two larger, it could be used to hang the stopper from the handle bracket. The Kelly Kettle cooking system is a long term cooking system that you can depend on. Whether you are bugging-in or boiling as you go, any one of the Kelly Kettle stainless steel models would be a worthy contender for that coveted spot in your collection of gear. I give them two thumbs up! So if you run solo or in a small group, the Trekker would be a good choice. For families and medium-sized groups, the Scout would likely be your best choice. And of course for large groups and stationary camps, the Base Camp model would be the one for you.